Antique and vintage glassware ranges from simple to fantastic, and affordable to outrageous - literally something for everyone. Use these online value guides to help you identify and value many different types of vintage glass. Learning about old glassware goes far beyond valuing it, however. In fact, oftentimes you have to figure out what type of glass you own before you can find the value. Take a look at these additional resources to learn more about your antique and collectible glass pieces. Some of the most beautiful and highly valued glass was made by a number of different companies in the 1890s and early 1900s. Durand Glass - Learn about a company that made gorgeous colored glass in the early 20th century. Tiffany Favrile Glass Marks - See several different marks used on authentic Tiffany glass. Quezal Art Glass - Find out more about this beautiful glass with a connection to Tiffany and Durand. Steuben Glass Works - Read about another glassware company with a following among collectors of art glass. 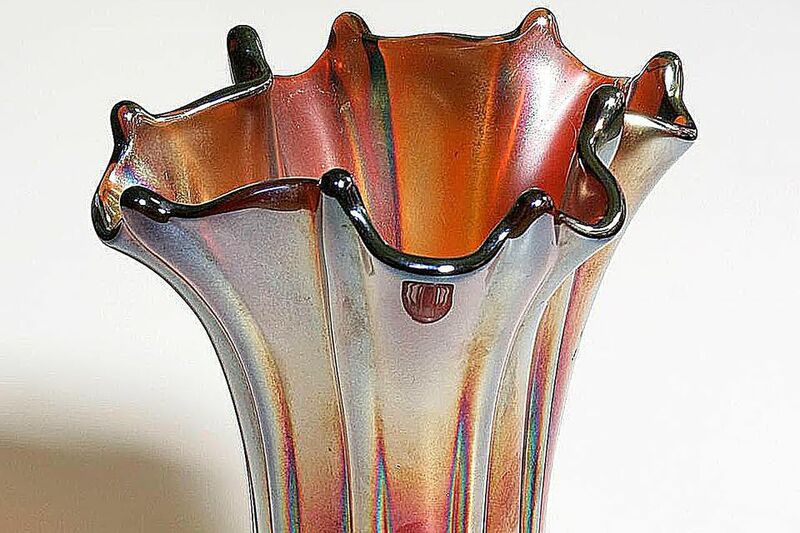 This type of glass made by a number of different companies is characterized by its "oil slick" coloring in varied hues. Carnival Glass Overview - Learn more about the origin of carnival glass and its mid-century revival. Carnival Glass Companies - Find out about some of the companies that made carnival glass at its peak of popularity. This molded glass is of low quality but its beautiful colors and fancy patterns have garnered a following with collectors nonetheless. A Closer Look at Depression Glass - Get an overview of the origin of Depression glass along with lots of useful tips for collectors. Depression Glass Patterns - Visit this pictorial guide to help you identify your Depression glass patterns. Cobalt Blue Depression Glass - Learn more about one of the most popular Depression glass colors. Pink Depression Glass - Information on another very popular Depression glass color. While made in both clear and colors like Depression glass, the quality of "elegant" glassware is significantly higher. Cambridge Glass - One of the most popular producers of what collectors reference as "elegant" glass. Fostoria Glass - Another very familiar name with collectors of high-quality elegant glassware. Heisey Glass - Rounding out the top companies in elegant glassware production, Heisey has a great following among collectors. Duncan and Miller Glass - While not as well known as the "big three" in elegant glassware production, this company made some lovely pieces in the same vein. One of the most prolific of American glassware companies, Fenton made everything from cranberry glass to milk glass in a plethora of patterns. Fenton Glassware Collecting - Learn about the varied items made by this company for more than a century. An offshoot of Depression glass, many useful items were made in a variety of colors in the 1920s and '30s. T his opaque white glass popular around the turn of the 20th century and again in the 1940s and '50s. Intro to Milk Glass - Learn more about milk glass motifs and the companies that made this type of glassware.